Whether your ride an Aprilia, Benelli,BMW, Ducati, Suzuki, Yamaha, Honda, Kawasaki, KTM, Triumph or MV Agusta bike you should know that our frame sliders and other sportbike protection accessories are meticulously designed and manufactured to provide the optimal balance of extra protection for your motorcycle's frame and bodywork while not transmitting excessive forces to your frame or engine mounts. The choice of frame slider material was chosen to best withstand impact, abrasion and to scrub off speed in the event of a lowside. Our frame slider designs allows impact forces to be transmitted to the stronger area of the frame instead of the vulnerable bodywork. Other frame slider manufacturers may use fittings or brackets that are cast from aluminum or recycled aluminum scraps that have a looser and therefore weaker grain structure or cast or stainless steel which is too strong and will cause all forces to be transferred to the frame. All our frame slider brackets and fittings are machined from high grade billet aluminum. This is considerably stronger than those made from 'cast' aluminum or aluminum scrap and not too strong as to damage the frame during impact. All our frame sliders and other sportbike protection accessories feature machined aluminum inserts which ensure the strongest possible contact between the frame slider, bolt and frame of your motorcycle. Additionally all our frame sliders come with high quality components like replacement galvanized 12.9 grade hardened steel socket head cap screws, 304 grade stainless steel washers and aircraft grade lock nuts(where applicable). All these features you are not going to find on products from other cheaper brands. Our components were carefully chosen so as to construct a system consisting of a series of staged sacrificial items during the event of a lowside or slide. No system is fool proof but a lot of work and thought had gone into our designs to try and provide our customers the best value for their money. We use mostly 12.9 grade (176,000 psi tensile strength) hardened steel socket head cap screws for our slider to frame attachments. Most socket head cap screws of this type are supplied for use as flywheel or connecting rod bolts. Our choice of bolts for this mounting configuration is so that they will bend instead of snapping when subjected to excessive stresses. They are almost always supplied in black finish but we take the extra step of having them plated for better corrosion resistance. This may affect their exact thread tolerances in some cases. Another thing we've been asked this a lot: "Why socket heads instead of standard hex headed bolts?" The answer is simple. A bolt fits into a hole in the slider. To tighten that bolt you will need a hex drive or a socket drive. If you use a socket because it's a hex head bolt, the hole in the slider needs to be bigger to accommodate the size of the socket, requiring the slider puck to either be bigger overall, or thinner walled. Hex drives are smaller profiled and therefore need a much smaller hole in the slider for the drive to be inserted. Socket head bolts are actually much harder to come by, especially in metric and non-standard pitch configurations. They are considerably more expensive, but we feel that they are a worthwhile expense. We do not use hex head screws, only socket heads and they are all either electroplated or stainless steel. Never black oxide coated because they will rust days after you install them. We also use stainless steel socket head cap screws for attaching sliders to brackets (in street no cut model frame sliders kits). Usually they are of Grade A2 (304) stainless steel with a tensile strength of about 101,000 psi. This type of fastener was chosen as they are meant to snap off on excessive impact before transferring that excessive force to the brackets which would amplify the forces to the mounting points on the frame. Washers: We only use 304 grade stainless steel in all our slider kits to reduce metal to metal corrosion and binding. All our brackets have usually undergone an extended period of consideration and design work to determine the best possible location for them and the best design that will do it's job safely. Anyone can make a bracket to offset a slider, we only do it when it makes sense and is safe to do so. That is why we sometimes do not offer a 'no cut' kit that uses a bracket for some models of bikes. Some bikes just do not alllow the safe and sensible use of them. 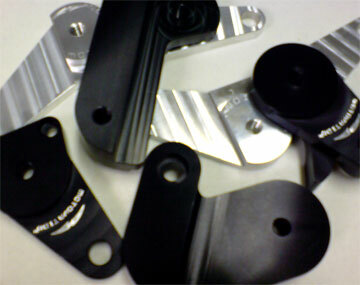 All our brackets are CNC machined from T6 alloy. This material offers the optimum weight to strength to elasticity ratio we could find in an aluminum alloy. We never use stainless steel or steel castings or welded steel brackets as they are much too strong. Cheap to manufacture but not ideal for their intended use.The majority of the components on your bike including the frame are made of aluminum. Using a steel bracket to attach a slider to a frame will cause too much of the impact forces to to transferred to the frame. Especially when the bracket's offset nature causes the forces to be amplified. All our brackets also have built in braces in their design to prevent rotation during impact events and to also help distribute those stresses over a larger area of the frame. It is easy to be seduced by cheaper prices or or poor imitations so make sure that you're not short changing yourself in the long run. Motovation Accessories uses a proprietary High Molecular Density (HMD) formulation of nylon. This nylon is impregnated during the extrusion process with UV inhibitors to resist destabilization of the molecular matrix and discoloration during prolonged UV exposure. This formulation is also molybdenum disulfide infused to give it the same lubricating properties as Delrin. This formulation is 75% more resistant to abrasion than Delrin and exhibits a reduced propensity to "chunk off" or "break off" during extended abrasive events and it's 'slickness' reduces it 'grabby-ness' during slides that may cause your bike to tumble and cause more damage. What about Delrin or ABS? Many frame slider manufacturers use them because it much softer, much cheaper and easier to machine, i.e. the material flakes off readily in a lathe and is much easier on the tools. The reason why Delrin is easier to work with therefore makes it a much less suitable choice than our selection for frame slider material. Notice in the pictures on the left that our material shows stringy edges at the point of abrasion. Delrin does not do this. It will chunk and break off on impact much more readily. Furthermore, Delrin is not UV stabilized and will discolor or turn grey in sunlight which will further downgrade it's structural strength. If you see a set of sliders that have been on a bike for a while and they are greying, they are most likely made of Delrin. When it is in that condition they will already have been destabilized by UV and will most likely crack when subjected to impact forces.